This is another favorite image from Sylvia and Joe's amazing destination wedding in Puerto Vallarta, Mexico. We travel a lot for weddings. This was our first time photographing one in Mexico and we were so excited! Sylvia was from that area, so she wanted her wedding there. The ceremony was at Our Lady of Guadalupe Church right in the heart of the city. The reception was at the NOW Amber Resort. It was gorgeous. Besides doing photos the day of the wedding, we also did portraits for the rehearsal dinner and then the day after the wedding! This was taken the day after! We went back into the city and walked around the area for photos. The bride and groom had a few places in mind they wanted to stop, but were up for anything on the way. Neal loved this cute little old couple standing on the sidewalk. There was a line of people waiting for buses and they happen to be at the end of the line. 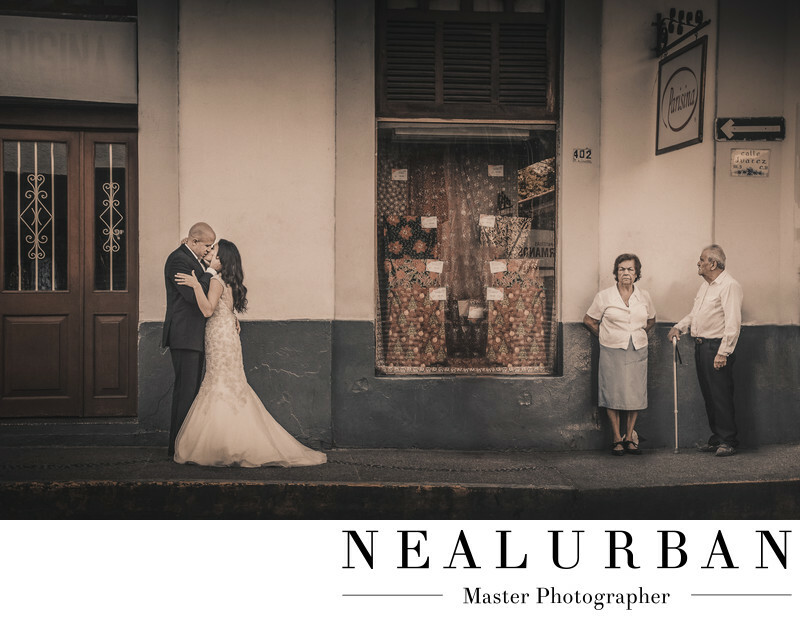 Neal wanted the bride and groom to cross the street and stand near them. He wanted them be in the shot! Then we had Sylvia and Joe have a kiss. We really liked the reaction from the man. He started to stare at the bride and groom. The woman could care less and was too busy looking at Neal and I. It was a great moment. We love walking around an area for photos with no set plans for everything. There is no pressure and it's more relaxed! We always get some great ideas and beautiful images this way!